You may have heard of exhaust gas recirculation, or EGR, that is part of your diesel or gasoline engine of your truck. You may have also heard the numerous complaints about this, and the many ways (some that are even illegal) that you can do to adjust the EGR of your vehicle to increase performance and decrease engine oil contaminants. If you don’t know what EGR is, EGR is an emissions reduction technology to reduce the amount of air contaminants and nitrogen oxide that is expelled from the engine. The EGR system directs some of the engine’s exhaust gas back into the cylinders, as this recirculation causes the engine’s combustion chamber to produce less nitrogen oxide to become expelled. The problem with EGR systems is that the recirculation of exhaust gases produces extra heat that is forced back into the engine intake that effects engine performance. There are also additional contaminants entering into your vehicle’s engine intake that does not become burned off. Instead, soot forms to clog your engine intake and dirty up your engine oil. Currently, there are two options available to improve the EGR system to reduce contaminants and lower the heat that is forced back into your engine’s combustion chamber: the EGR Delete and the EGR Cooler. The EGR Delete is a kit installation that removes the inter-cooler pipe that forces heat back into the intake and replaces it with an aluminum tube that doesn’t re-enter the EGR system. The EGR Cooler is a heat exchanger that is installed on the EGR circuit. As hot exhaust passes over the heat exchanger, it is cooled as this reduces the nitrogen oxide circulating back into the engine system. When it comes down to it, the EGR Cooler is the better choice for your EGR system. The EGR Delete compromises the purposes of the engine’s gas recirculation, which is to reduce the amount of air contaminants and nitrogen oxide causing air pollution. Because of this, you are — in fact — driving an illegal vehicle on the highway. Your vehicle can no longer pass the emissions test, so if you drive it around you are breaking the law. Also, every time you turn on your vehicle while using the EGR Delete, the “Check Engine Light” will flash as your vehicle’s computer diagnostic senses that the EGR is not working properly. The EGR Cooler is legal, will allow your vehicle to pass the emission test, and will not set off the Check Engine Light. You also won’t have to purchase a tuner, like you would for the Engine Delete, to restore your vehicle’s power and performance. An oil cooler leak on a diesel can manifest itself in several ways, but critical in every case and requires immediate attention. Oil flow and temperature as well as EGR cooling are the two foremost problems with most diesels-especially Ford 6.0 liter engines. The coolant and oil temperatures must always remain within 15-degrees on one another. This is critical to prevent oil breakdown and engine overheating. One of the biggest oversights in the design of the most popular diesel engine, the Ford 6.0 liter, was the size of the oil cooler and the EGR cooler cooling surfaces. The EGR cooler is a long pipe on the passenger side above the valve cover designed to direct exhaust gases to the intake manifold. In order to cool these gases to the appropriate temperature a radiator core similar to a heater core is placed inside the pipe. Coolant passes through the radiator core inside the pipe to cool the gases passing through the pipe and around the core. The radiator core is subjected to a constant 1000 to 1500-degree heat from the gases and an outside pressure of 50 psi . Due to the large amount of soot created by a diesel, the inside of the cooler pipe accumulates enough soot to impede the flow of exhaust gases. On the other hand, the core itself becomes plugged internally with scale from the coolant system, sand from the casting process and gel from the overheated coolant. If you experience no driveability problems although it is necessary to top off the coolant level in the radiator often, it is likely that the EGR cooler hose is leaking. If steam can be seen coming from the exhaust and you experience a power loss coupled with a poor idle, the EGR cooler is leaking internally and must be replaced. This is a serious situation that will eventually result in either a blown head gasket, engine coolant blowing out of the coolant reservoir, bent rod or broken piston and oil in the coolant. When the EGR cooler leaks, the core allows coolant to enter the intake manifold. A large leak generally will cause back-pressure to enter the radiator and cooling system causing the engine to overheat as well as the engine oil. A dealer will charge $2800 or more to replace the EGR cooler. Although it looks intimidating when first gazed upon, it is not very difficult to replace yourself and save thousands of dollars. It only takes two to three hours to complete. Replacing the EGR cooler or hose requires the removal of the batteries, air intake ducts, turbo intake duct, turbo, intake manifold and finally the cooler. Get a service manual at your local auto parts store. It will give an in-depth procedure with illustrations to make it easy. The EGR cooler and oil cooler are the only two major problems with a Ford diesel engine. Replacing the old cooler with an OEM is much like placing a Band-Aid on the problem. Purchase an after-market bullet proof cooler that uses aluminum tubing rather than a radiator core to cool the gases. It will not crack or fail like the original. At the same time while the manifold is off, replace the oil cooler as well since it has the same deficient core inside. The new oil cooler comes with an adapter bracket and moves the oil cooler to a different location near the radiator. It uses the same type of tubing and will not clog either. Replacing these two coolers will result in a much more reliable engine and protect your investment. The HEUI fuel injection pump is in reality the HPOP (high-pressure oil pump) on a Ford 7.3 or 6.0L Powerstroke diesel. 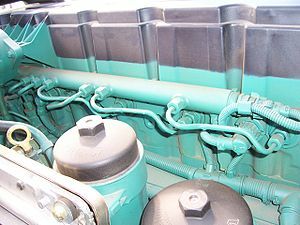 The Ford 6.0L (International) Powerstroke diesel uses electro-hydraulic fuel injectors located under the valve covers. The high-pressure oil pump (located at the rear of the engine under the turbo charger) exerts extremely high oil pressure (up to 4000 psi) to build fuel pressure. A lack of sufficient pressure due to leaks or worn parts in the pump will cause a no-start situation resulting from insufficient fuel pressure. A diesel engine ignites its fuel by the heat generated through highly compressing the fuel rather than relying on a spark for ignition. These engines offer good fuel economy and excellent longevity, lasting much longer than a conventional fuel vehicle. They also produce superior torque for hauling or towing. The flip side to this coin is that they are not maintenance free. As a matter of fact, they require very specific service intervals and have proved to be very unforgiving should the service be ignored. Such high oil pressure results in more rapid wear causing leaks and failures over time. Generally, these failures are isolated to O rings or the pump itself. The pump can experience an internal or gasket failure, both of which will reduce oil pressure. The second major cause are the O rings on the oil pressure rails supplying pressure to the fuel injectors located under the valve cover. O ring failures are not curable with the replacement of the O rings. The threaded section of the shaft forward of the O ring wears from the high pressure. Replace these parts with new or rebuilt parts only. To extend the useful life of the oil pump, seals and O rings the oil and filter must be changed religiously between 3000 to 5000 miles. Diesels must not use normal automotive oil due to the high pressure. The oil must be API rated CI-4 or higher. The viscosity must be SAE 15W-40. These oils will always be in a separate section for diesels. To avoid premature fuel-related O ring failures always avoid fuel with a high sulfur content. It kills the O rings causing further leaks. In a fuel injection engine the fuel is forced through a small nozzle at high pressure, which atomizes the fuel. It has taken the place of carburetors as the primary fuel delivery system for automotive engines. While there are various systems for a range of fuel types, the most common ones are for gasoline or diesel. Around the turn of the twentieth century Herbert Akroyd Stuart created the first machine that resembles the fuel injection. His version used a jerk pump that would measure the fuel into the injector. This early version was then modified by Robert Bosch and Clessie Cummins who adapted it for diesel engines. With their enhancements, the fuel injector was able to become widespread in use for diesel engines by the mid 1920s. Not too long afterwards, however, in 1925 Jonas Hesselman of Sweden began his own developments that allowed the engine to start on gasoline and later switch to kerosene or diesel. This newer version used a spark plug for ignition. This enabled the invention to be used in certain types of aircraft during the Second World War. During this period the automotive industry was undergoing a great amount of development and change. Fuel injection engines during this period cost too much and were seen as unreliable to gain any hold in the market for gasoline automobiles. In the mid twentieth century, however, that began to change. In 1955 Mercedes-Benz used a Bosch system to create the 300SL model, the first commercial use of a fuel injection engine. Chevrolet followed suit in 1957 in the Corvette. The engine continued to improve, and ten years later, in 1967 Bosch demonstrated the first electronic fuel injection with the D-Jetronic. The engine was used in the Volkswagen 1600TL and spread to the major luxury cars, including Porsche, Mercedes-Benz, Jaguar, and Volvo from there. The timing worked perfectly for automobile companies who were beginning to find themselves subject to increasing government regulations around the same period. The fuel combustion system changed the automotive industry for the better. Drivers are able to start their cars in various weather conditions with confidence. Although the technology has been around for about one hundred years, it was only in the past few decades that enough advancements were made the enabled for use in the automobile. The electronic control module, or ECM, is the “brain” of a vehicle. The vehicle uses sensors to tell the ECM what is going on in the engine. It also uses some sensors to tell the engine what to do. These sensors get their instructions from the ECM. What Does the ECM Control?The ECM controls only things related to fuel injection. A fuel injected vehicle generally runs on 14:1 — 14 parts air to one part fuel. The mixture must be perfect or the vehicle will not run properly. If the mixture is too far off, the vehicle may not run at all. The ignition system is related to fuel injection and is controlled by the ECM. The ignition must send the spark at the proper time. A four-stroke engine has four strokes. The first stroke is the intake stroke. On the intake stroke, the pistons go down in the bore, which his then filled with the air and fuel mixture. When the pistons come back up, it is compressing the air and fuel mixture to make it ready to fire. This is the second stroke, or the compression stroke. The third stroke is the combustion stoke. At this point, the pistons are coming back up. 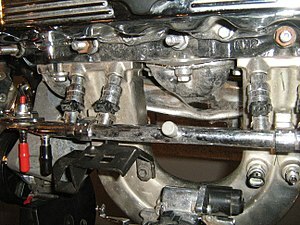 The ignition system fires the spark plugs, which light the compressed air and fuel mixture in the cylinders. This forces the pistons down in the bore. The camshaft opens the exhaust valves and lets the resulting gas or exhaust out. This is called the exhaust stroke. Sensors: In order for the engine to work properly, everything must be “just so.” Sensors sense the barometric pressure outside the engine. Temperature sensors measure how hot the engine is running. There are several more sensors that sense various variables. All of this information is forwarded tot he ECM. The ECM translates the information, then tells the fuel injectors how long to stay open. The longer a fuel injector remains open, the more fuel that goes into the engine. If the air is thin, meaning less oxygen in the air, the engine needs less fuel to make up the 14:1 ratio. If the air is thicker, such as at lower sea levels, the vehicle needs more fuel to make up the 14:1 ratio. Other sensors, such as the oxygen sensor, sense how much oxygen is in the exhaust. Much of the unburned exhaust is routed through the EGR and back into the cylinders to cool the cylinders. The ECM also senses this and uses information from the EGR to determine the proper air to fuel mixture.